This post should really be titled – “Turn you into a pizza snob, pizza.” I have tried various recipes for pizza dough over the years, and they were good and all.. but they still had that, shall we say, “homemade” quality to them. However, ever since I tried this pizza crust recipe from Tammy’s Recipes (are you noticing a theme of my love for Tammy’s Recipes yet?) it has been our go-to pizza. All of a sudden I could whip out a gourmet pizza in no time flat – and with probably the easiest method possible. A lot of times I will triple the recipe and use it to make two pizzas – resulting in a slightly thicker, but still thin, crust. You really must try it – eating restaurant pizza will never be the same! To make crust, place warm water and salt into a medium mixing bowl. Add a cup of the flour and the yeast, and stir. Add remaining flour (1/3 cup) and stir or knead into a sticky dough, adding additional water if needed. Allow dough to rest, covered with a clean towel, for at least 10 minutes but up to 30-45 minutes. The dough will definitely be stickier than a regular bread recipe, but will still hold together in a nice ball. If you have a bread machine, this first step can be done by putting all crust ingredients into the machine and using the dough cycle to knead for 10-15 minutes, until a soft, sticky dough is formed. Stop the machine and allow dough to rest for at least 10 minutes, or up to 30-45 minutes. I usually use my stand mixer with the dough hook. Liberally butter a 16-inch round pizza pan, and then with your clean buttery hands, spread dough thinly over the pan. Be gentle and have patience, as this does make a perfectly thin crust! This is soooo much easier than rolling out a crust! Just get nice and buttery and smoosh that dough to the sides of the pan. Spread the sauce over the dough/crust and allow to rest for 15 minutes or longer (up to 45 minutes). Put the rest of your toppings on and bake at 450 degrees for about 10 minutes or until it is your desired amount of crispness. The best thing about this recipe is the time factor – no waiting around for your dough to rise! Just mix it up and during that first 10 minutes prepare your sauce or cut up some veg. After you smoosh out your dough and put on your sauce, get the rest of your toppings ready while you are waiting for the second rise. Top and then bake that sucker – perfect Friday night (or any night) dinner! 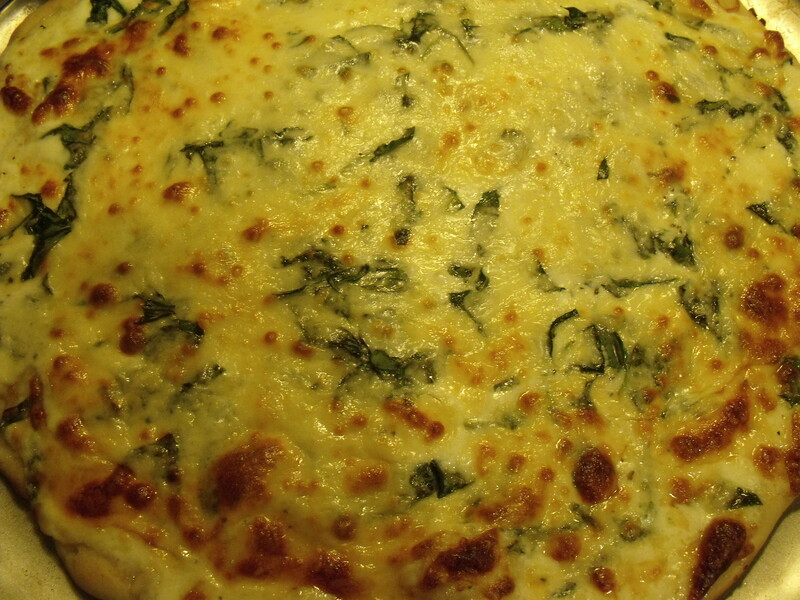 Our favorite way to top this crust is by using a sauce made of melted butter, salt, garlic powder, and basil. (I think that a butter sauce tastes the best with this type of pizza because it is lighter – but a traditional tomato sauce will work too.) 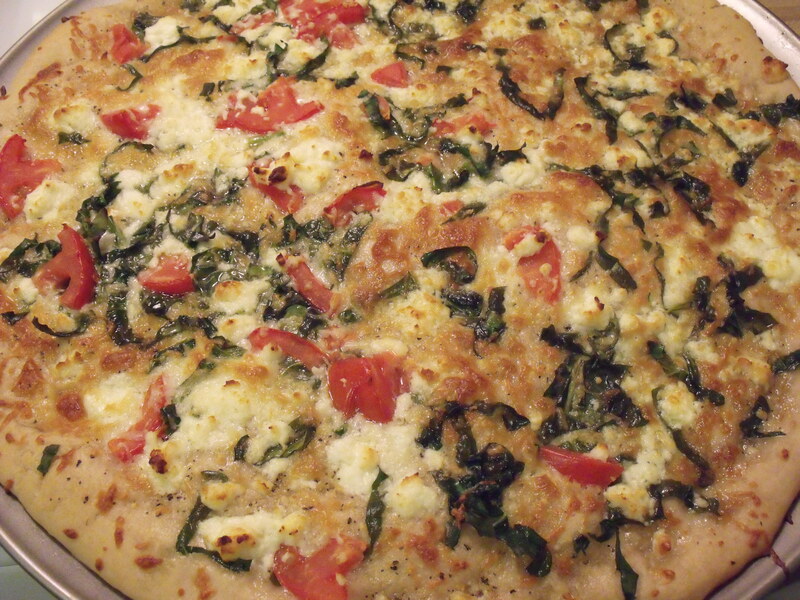 Then, we add some mozzarella and feta cheese, tomatoes and spinach. So. Good. 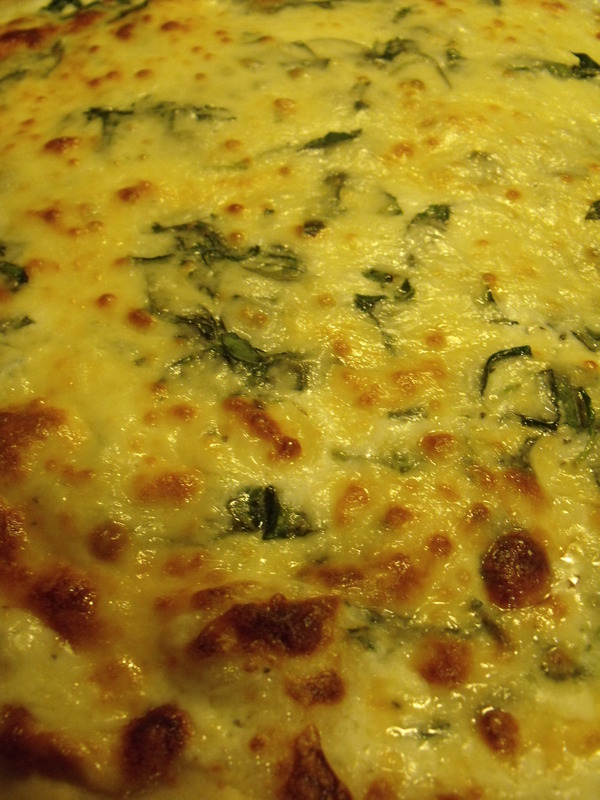 The last time I made it I experimented with an alfredo sauce, mozzarella cheese, and spinach – that was pretty darn good too. For the last time – I am not kidding – try this pizza and you will be happy. I get frustrated with homemade doughs – they never come out how I like ’em. I’ve fallen into just using Publix’s premade dough, which is good, but I’d rather have homemade. This one looks nice and easy, and the butter and garlic sauce sounds really, really good!